GSIDC | Widening and Improvement of MDR No.2 between chainage 3.40 Km to 9.12 Km from Merces to Goa Velha (Part). 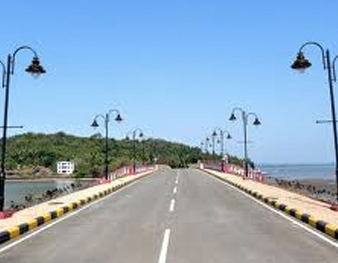 Widening and Improvement of MDR No.2 between chainage 3.40 Km to 9.12 Km from Merces to Goa Velha (Part). Hot mixing (laying of bituminous macadam and asphaltic concrete), lane marking, construction of culverts, providing gutters and cross drainages wherever required. The approximate length of the road is around 5.72 kms. M/s. Assmas Constructions Pvt. Ltd.
Construction of Bus Stand at Valpoi. Construction of Corjuem Poira bridge including approaches.